1. Insert the ‘Home’ stick into an available USB port on the computer you want to connect to. This computer must have a constant and reliable connection to the Internet. Once inserted, the computer may take a moment to recognize the newly-inserted drive on first use. Once the drive is ready for use, you are ready to launch the Miracle Sticks Home application. Miracle Sticks will attempt to auto-launch. 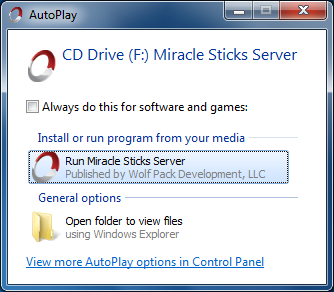 If it does, click ‘Run Miracle Sticks Server’. 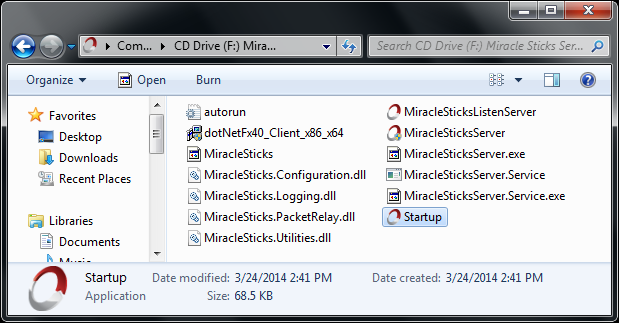 If Miracle Sticks doesn’t auto-launch, simply navigate to the Miracle Sticks drive and double click ‘Startup’. You will be presented with the End User License Agreement (EULA) the first time the application is run. Scroll down to read the entire agreement and click ‘Accept’ to continue. The computer must have the Microsoft .Net 4.0 or above framework installed. If it is not already installed, Miracle Sticks will guide you through the install process. Note that this process will require a reboot. Once the Miracle Sticks Home application is launched, you will provide a ‘Computer Name’ and a ‘Password’. It is essential that you assign a strong password. See the Important Notes later in this guide about strong passwords. Once you’ve entered a ‘Computer Name’ and ‘Password’, you can press the Enter key on your keyboard or click the green ‘Start’ button. During the launch process, Miracle Sticks will attempt to port forward your router to allow for a direct connection. A direct connection is not required for Miracles Sticks to work, but will provide for the best performance and user experience. 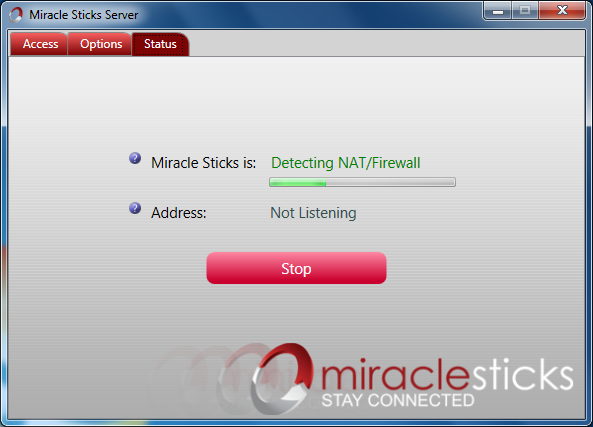 If Miracle Sticks was unable to automatically port forward your router, it will default to relay mode. We recommend that port forwarding be enabled for best performance, but it is not required. When connected in Relay Mode you will see the following message in the bottom right of your screen. If you wish to port forward your router, please see the “Important Notes - Port Forwarding” section later in this guide. That’s it! Your ‘Home’ computer is now ready for you to access anywhere in the world! 2. Now that your ‘Home’ computer is online, you can use your ‘Away’ Miracle Stick to connect back ‘Home’. Insert the ‘Away’ stick into an available USB port on the computer you want to connect from. This computer must have a connection to the internet. The computer may take a moment to recognize the newly inserted drive on the first use. Once the drive is ready for use, you are ready to launch the Miracle Sticks Away application. Miracle Sticks will attempt to auto-launch the application. If it does, click ‘Run Miracles Sticks Client’. If the application does not auto-launch, simply navigate to the Miracle Sticks drive and double click ‘Startup’. Once launched, Miracle Sticks will automatically find your ‘Home’ computer and prompt you for the password. Enter your ‘Home’ password from step #1 and press Enter or click on the green ‘Connect’ button. That’s it; you’re now connected! This cannot be emphasized enough. Your password protects you from unauthorized access to your computer. If someone figures out your password, they will have complete access to your computer. It is essential that you provide a strong password to protect yourself. Always use special characters such as punctuation marks as well as numbers in your password. Your password is case sensitive; you are encouraged to use both upper and lower case letters. Never use words that are contained in a dictionary or proper nouns such as names (this means no pets or children names). Protect yourself! You may have a third party antivirus or firewall application installed on your computer. Some common examples are Symantec, McAfee, and AVG. These applications may attempt to block Miracle Sticks. If they display an alert, you must allow Miracle Sticks to run. If there is an option to always allow the application to run, selecting it will eliminate this message in the future. If your ‘Home’ computer goes into Sleep or Hibernate mode, you will not be able to connect to it. To avoid this you must turn off these power options within your Control Panel. Each version of Windows is a little different, but in general you should navigate from you Control Panel to ‘Power Options’ and set any sleep or hibernate options for your plugged-in ‘Home’ computer to ‘Never’. If your ‘Home’ computer is set to Auto Update, it may reboot without your consent. If your ‘Home’ computer reboots, you will not be able to access it until you restart the Miracle Sticks Home application. To avoid this interruption you must set your Auto Update to update only when you choose. Port forwarding will allow your ‘Home’ computer and ‘Away’ computer to connect directly. This will improve your user experience. Each router has its own method of enabling port forwarding.